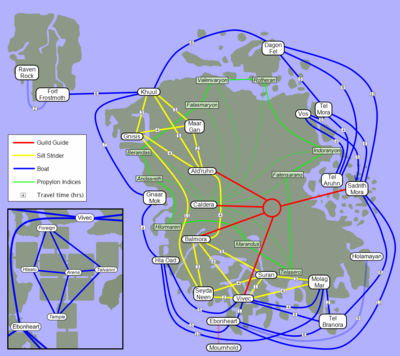 Route map showing quick-transport options throughout Vvardenfell. Vvardenfell is a vast landscape. There is even a quest whose sole objective is to walk from one side of the map to the other without talking to anyone, and this is likely to be an undertaking of half an hour or more, depending on how fast you can move. Luckily, most of the time you have no such issue with conversation, and are thus free to engage one of Vvardenfell's manifold quick-transport options. 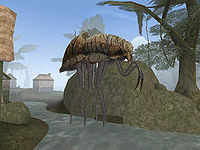 Note that non-magical transport takes time: although you may not realize it, a few game-hours will pass between, for example, boarding the Silt Strider in Gnisis, and getting off in Ald'ruhn. This time in transit counts as resting to restore health, magicka, and fatigue. 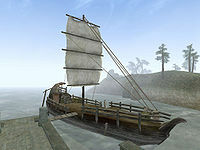 Boat transport is available to most of the coastal cities on Vvardenfell. There are various types of seagoing transports, the most common being a large single-masted three-deck ship, or the smaller open boats found in the poorer settlements. * These ships only offer travel services about half way through main quest. * Becomes available during the Bloodmoon East Empire Company quest. The gondoliers in the holy city of Vivec transport customers from one canton to the next for nominal fees. Additionally, they carry one of the most unique hats in the known world. It can only be gained by killing the person wearing it, so don't try if you feel you need them to navigate the city. For information about the Guild Guide class, see Guild Guide (class). Each branch of the Mages Guild maintains a Guild Guide, an expert in Mysticism who maintains magical contact with her counterparts in the other guilds and, for a fee, will instantly teleport individuals between guild locations. Guild Guides are usually identified standing near an empty platform or room at the rear of the guild, and will offer transport when asked about Travel. The guides' prices vary according to their disposition. This can become the cheapest mode of transportation, perhaps because you are teleported rather than transported (boats and silt striders take time to arrive at their destination). For this reason, you do not "rest" while traveling and regain health or magicka as you do by boat or strider. Guild Guide services are available at each of the five Mages Guild halls, and each guide can transport you to any of the other four. Be aware that due to the Mages Guild's hatred of House Telvanni, if you join the Telvanni and rise high enough in their ranks you may reach a point at which the guild guide's dispositions towards you are so low that they refuse to offer their travel service. Raising their disposition from this low level may be difficult if your character does not have a high Speechcraft skill. If you ever find yourself in serious trouble, you should have listened to the advice of seasoned adventurers: always carry some Divine Intervention or Almsivi Intervention scrolls with you. These effects transport you away from your impending moment of doom to the safety of an Imperial Cult shrine or the nearest Tribunal Temple, respectively. If you find that you use these effects frequently and/or don't want to invest money in buying lots of scrolls, you can get them as normal spells or enchanted items. This can also be used as free, instantaneous transportation for frugal people and to carry bulk amounts of loot to a safe, nearby city. The transportation ignores overencumbrance, but once transported, you'd be stuck there until you drop items or otherwise make your encumbrance manageable. The expansions add three more locations. Fort Frostmoth, an Imperial Shrine in Solstheim, is added by Bloodmoon. The Imperial Cult Services area of the Royal Palace, which contains an Imperial Shrine, and Mournhold Temple, an Almsivi Temple, are added by Tribunal. You will only be transported to Mournhold Temple or the Royal Palace from other locations in or below Mournhold. (Thus any location added by the Tribunal Expansion.) Fort Frostmoth can actually be reached by Divine Intervention from the northwestern-most corner of Vvardenfell, thus saving the boat trip. However, most places on land in that region will end up taking you to Gnisis instead. Note that there are a few locations where Intervention spells are disabled. In Morrowind, the only two are Magas Volar, the Daedric temple where you receive the Daedric Crescent (only on the GOTY edition), and Akulakhan's Chamber. In Tribunal, Intervention is not allowed from The Clockwork City. In Bloodmoon, you cannot cast the spells from underneath the Mortrag Glacier. The school of Mysticism also contains the effects of Mark and Recall. These allow you to be your own instant transportation as Almsivi/Divine Intervention do, but this takes you to a point of your own design. Mark sets the point, and Recall takes you to the mark you made. This can be used for marking a place you'd want to return to easily and repeatedly, or for setting a "home" where you want to store the valuables you've gained in your travels. It is also very useful to return to a quest giver after completing a quest. The downside is that (without mods) you can only have one location Marked at any one time. Casting Mark again overwrites your previous Mark. The propylon chamber system was devised to allow instantaneous travel among ten ancient Dunmer strongholds, which are scattered across Vvardenfell and quite isolated. Each chamber links to two others, forming the propylon circle. To transport to a specific stronghold, you must be carrying the correct propylon index. The indices are scattered across Vvardenfell, and often go unnoticed because they are so small. Chances are not very good that you will stumble across all ten on your own, but fortunately there is a list of index locations. The need to carry all ten indices and to follow the propylon circle in order is eliminated by the Master Propylon Index. The master index is a direct link between Caldera and every propylon chamber. It was not part of the game originally, but Bethesda added it with an official plugin which can be downloaded here. The plugin has Folms Mirel send you on a quest to retrieve every index, being given the master index as a reward. There is also an eleventh Propylon Chamber located in Kogoruhn, though it is now no longer functional. † This bug is fixed by the Morrowind Patch Project. Note that the Aundae, Berne and Quarra Amulets should cease to function if you are cured of vampirism. Two other people who offer teleportation services are added by the Tribunal expansion. You must first have been attacked by assassins and spoken to Apelles Matius in Ebonheart in order to receive these services. After that, Asciene Rane will offer you free, instant transport to Mournhold when you ask her about Transport To Mournhold. Effe-Tei in the Royal Palace can transport you back. Running diagonally is sqrt(2) times faster than running forward or strafing. Jumping is faster than running if your Acrobatics is equal to or greater than your Athletics, and with a Jump spell and its variations you can go even faster. However, this will drain your fatigue quickly and if you are unexpectedly attacked on your journey your ability to defend yourself will be limited. The solution to this is any enchanted item with its constant fatigue replenishment effect. Speed, Agility, Strength (which lowers your encumbrance), Acrobatics and Athletics all affect your speed. Spell Effects like Restore Fatigue, Fortify Fatigue, Feather (which lowers your encumbrance), as well as Fortify Attribute and Skill (for the previously mentioned stats) will magically enhance your speed. Spell Effects such as Levitate and Water Walking will help you cross difficult terrain. The Boots of Blinding Speed can be obtained through a simple quest and provide an incredible speed boost at the expense of a loss of vision. You can gain a hundred-point Levitate effect lasting an entire day by visiting the Shrine of Daring in Vivec and offering a potion of rising force; it is easily reached with Almsivi Intervention from anywhere near Vivec, while the potion can be purchased cheaply from the temple nearby. While this effect is active, you can cross the countryside far faster than with normal walking. Note that it will likely expire if you use silt striders or boats for transport, so the best way to take advantage of it is to Mark your current location, travel to Vivec through Intervention spells and the Mages Guild network, then Recall back to the location you want to fly out of. This combines particularly well with the Boots of Blinding Speed, since the high-speed, high-altitude flight lets you navigate using your map and makes it unnecessary to see normally. This page was last modified on 15 April 2019, at 20:30.